What we are offering is an addon for PES PRO which allows you to make money from CPA Lead. This addon adds the ability for you to add an Offer Wall to your website. Members complete offers or download apps through the offer wall, which you get paid for. In return your members will get free coins to use within the system. You can set the exchange rate through CPA Lead. For example, for every $1 you earn from an offer, the script will credit the member 100 coins. What features does this addon have? 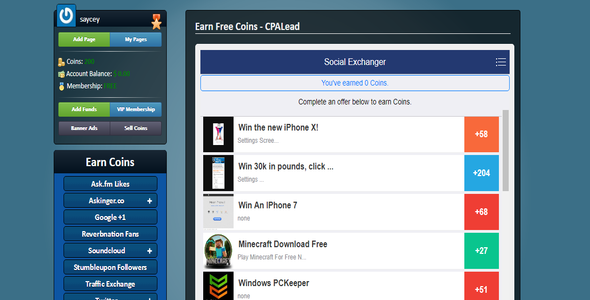 At the moment its only feature is to add an Offer Wall from CPA Lead to your website. This price includes FREE updates and FREE installation (If Required).